You probably have a great website, lots of good content, and are sharing that content all over the web. You check the speed and the functionality of your links regularity, to ensure that navigation is fast and easy. And you have probably, if you are using pros to conduct your website reviews and updates, reduced content, media, etc. to increase compatibility with mobile devices. Good for you! Your Competitors are Taking Different Approaches! Just reducing functions, tools and content to accommodate the growing number of mobile users is probably not enough. You may need to go back to the beginning, to start from scratch, and build upward, not downward. This is now known as the "mobile first" strategy, and it makes sense if you want to spread your content via mobility and generate the traffic and customer conversions you want. Take a look at what is not just the future, but what is the "today" and why you have to make this conversion immediately. There are now over 1.2 billion mobile users, and the number grows daily. Just look around you - at restaurants, on public transportation, at airports and in the grocery store. Smart phones have become a third bodily appendage. If your site and content is not easily accessible and fast, none of these 1.2 billion and growing people want to stay and read. In the U.S. alone, almost 30% of mobile device owners are mobile-only users. That's a huge base of potential visitors, and you are losing out if you are not ready to greet them well. Mobile device sales are increasing far more rapidly than those for laptops and PC's. We will become a world of mobile access only. If people are carrying the web in their pockets, you had better be in those pockets with a site and content that is really rapidly accessible. Therefore being one step ahead in adopting your content for multiscreen will bring you HUGE benefits. Having a "mobile first" strategy just makes sense, even though it may require a real paradigm shift for traditional web-based business owners who love their site designs, their blogs, and all of the cool stuff that visitors can do and learn on those sites. You have to go back to the beginning. A site must be designed for mobile use first. Get everything working fast and focus on the important basics that you can get into that mobile design and then expand and enhance for your PC user. It's a lot easier than taking an existing PC-compatible website and content and trying to decide what to cut out for mobile device accommodations. Mobile First forces you to re-write content and to do it creatively and in ways that will "hook" visitors quickly and give them exactly what they are looking for and no more. If you struggle with this conversion of content, check out this guide to learn how to create viral longposts driving your traffic! Following in Google's footsteps, now Facebook, Yahoo and Twitter have declared they are "mobile first." If your content is not mobile friendly, no matter what you try to put on any of these social media sites, readers will not be able to access it all and access it quickly - Major Fail. Think about the SEO benefits. Part of those page rankings depends upon how many "hits" your site gets. Mobile-only users who cannot get to you obviously won't access you, and page rankings will slip in favor of those competitors who are fully mobile-friendly. 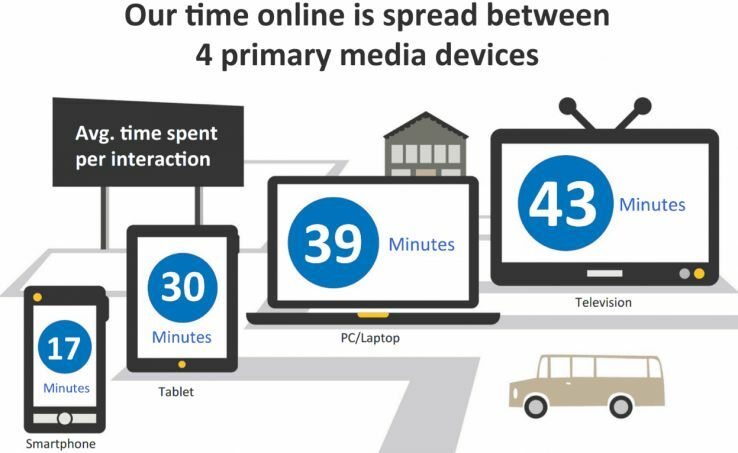 Consider the times when people are on their mobile devices and when they are on PC's. PC use is highest during work hours, because these are the devices used in the workplace. But this is not when most searching for content, sites, products and services occur. During non-work hours, when people are searching for personal reasons, they are using their mobile devices, not their PC's. This alone should move you to you mobile compatibility plans. Here is the research results of SalesForce Marketing Cloud describing how people are using mobile devices during the day. Start-ups among your competition are using a "mobile first" philosophy because they see the future that is actually today. They are ahead of the game, and you need to get in that game NOW. 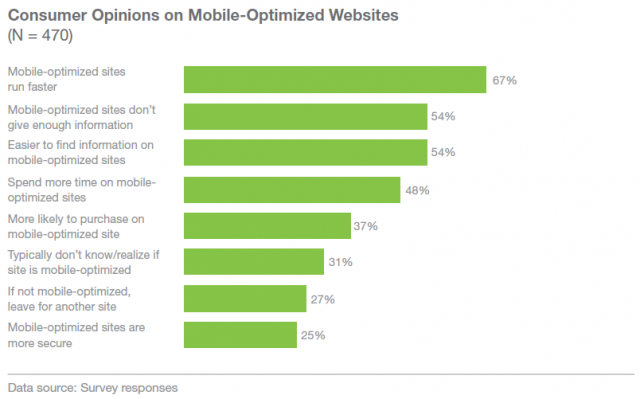 More than 25% of Google searches are now conducted from mobile devices. This is a huge number of people, many of whom you want to connect to. Local searches (for restaurants, points of interest, etc.) are now 75% mobile. If you own a brick and mortar business, your content needs to be available within seconds of a search. A survey recently reported that 61% of "searchers" prefer the "brand" that gives them a decent mobile experience. Well over 60% of mobile device owners use those devices exclusively to check their emails. Are your announcements, news items, and special sales getting to those mobile devices effectively? Social media and blogging are critical methods by which you are getting content to current and potential customers. 55% of mobile device users connect to social media exclusively through their mobile devices. A lot of the 55% may be your future customers. Speed is critical to mobile device users, just as it is to PC users. When your content is perfectly designed for mobile users, they find you quickly - within seconds. If they don't, they move on. Even news organizations have discovered that more than 50% of their readers access them via mobile devices. They are all moving to a "mobile first" strategy. You need to follow their lead. Have a look on New York Times mobile version! You can learn many from such sites as they manage tons of content. You can easily test your mobile version for any kind of device using this site on desktop. Your customer base is what it is all about. Yes, older people are still using PC's perhaps more than mobile devices, but an entire generation is moving up to take their places, and this generation wants mobile. If you want to expand your customer base (unless you are selling "Depends" perhaps), you have to go where the customers are. Checkout procedures are a "must." If a consumer cannot access a site, make a purchase, and checkout within seconds, s/he wants nothing to do with a site. Content shifts to mobile have to include these critical functions. The future is today and it is also in the future. Having great content that is mobile-friendly today does not mean you ever stop. As newer tools become available, and as mobile technology becomes more sophisticated, you job is to utilize that technology to improve your content delivery. It will be a never-ending process, so get used to it! Andy Preisler is an experienced blogger and passionate marketer who works mainly with content marketing, educational issues and business relations. His primary interests are engaging people to selfgrowth and staying motivated. Find Andy on Twitter or check his blog.